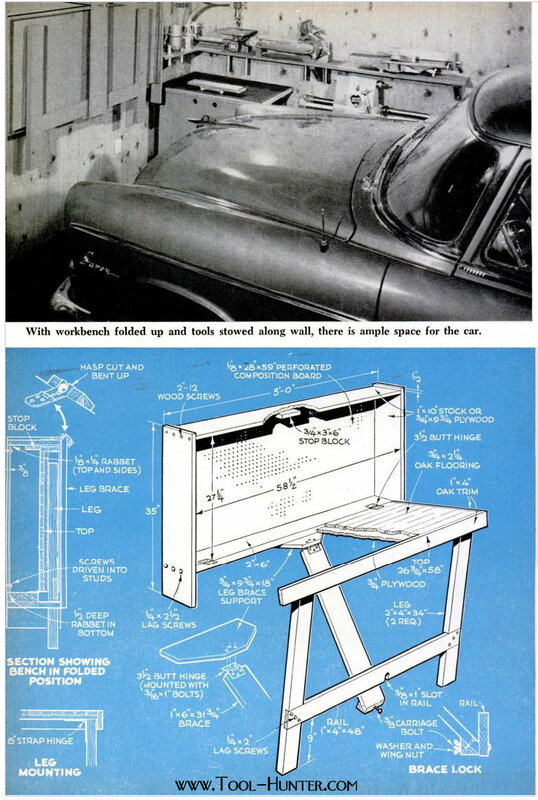 In 1955 the engineers at Magna Engineering Corp designed a neat set of shop-built accessories to help the Shopsmith Mark V and all it's add-ons live in harmony with the car in the DIYer's garage. 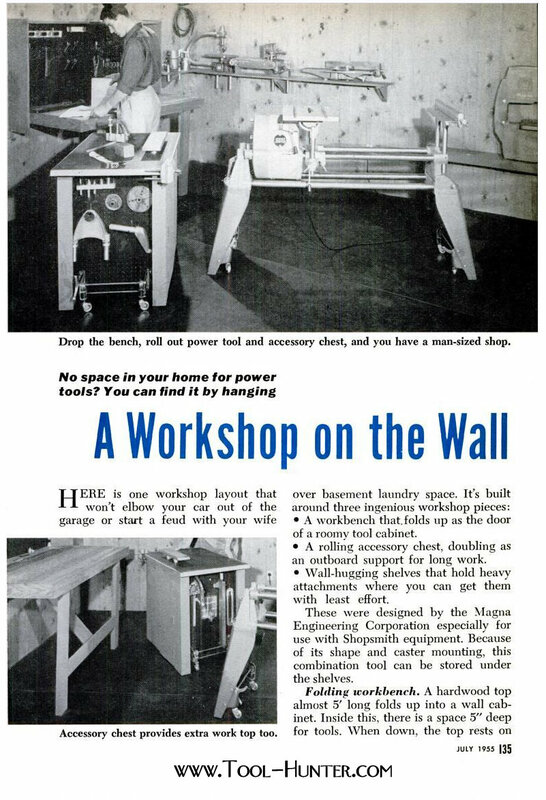 Back in the early 1990's I was asked by Shopsmith Inc to redesign the Workshop On The Wall to accommodate the larger parts of the modern Mark V Model 510. The results were and I believe still are sold by Shopsmith, and depending on the printing you will see my name on the back. I wasn't totally satisfied with the results because we had to make the wall cabinet taller, which in turn made the bench deeper. Even at 6' tall, when the bench is lowered it's quite a reach to grab parts in the center of the cabinet. If I were to redesign this I believe I would build the larger cabinet, but make the bench 24-30" deep. 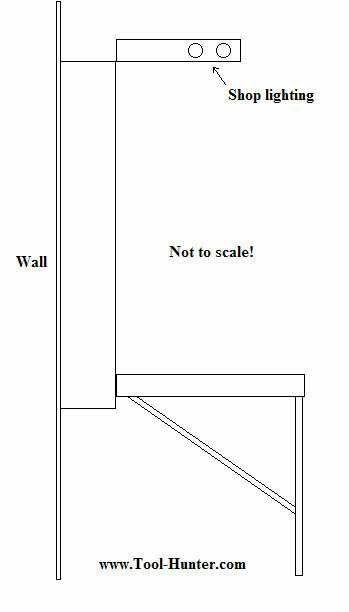 Then I would make another "door" that would swing up and which could house lighting, as shown in my third-grade-quality MSPaint drawing below. One thing that was WAY more work than it needed to be was the portable cabinet. 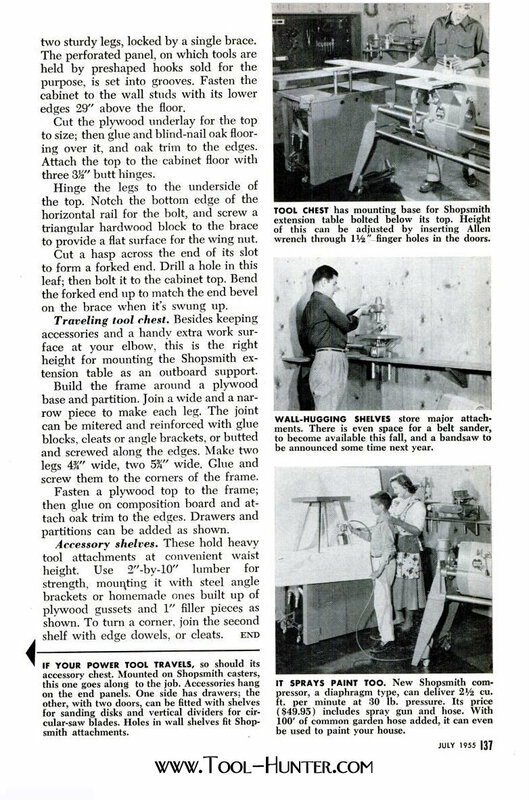 They designed this with about 1,000,000 parts, which just isn't necessary with today's sheet goods (plywood, MDF, etc.). 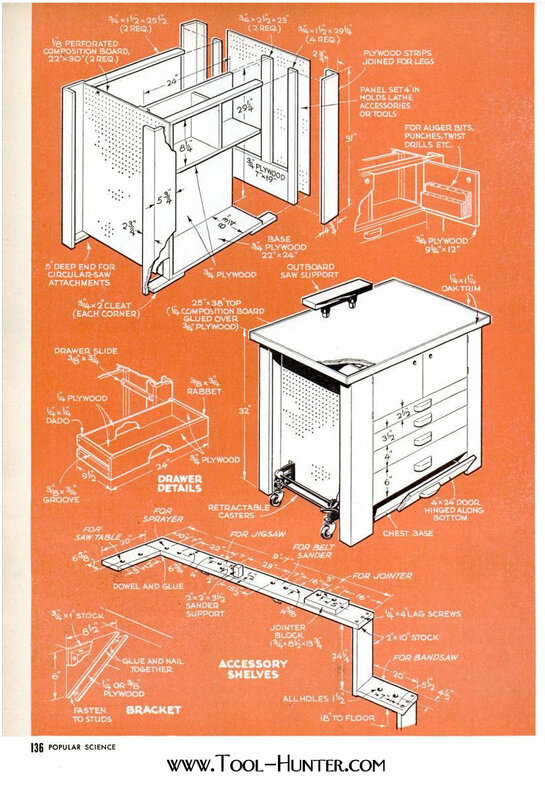 The diagram in the article doesn't show that there is a Shopsmith SPT mounting base mounted under the table to accept the Mark V's extension table. The two set screws are accessed through two strategically placed holes in the back of the cabinet. Also, the version I made unitized the standard Shopsmith retractable casters. This required a couple wooden wedges that made-up for the fact that the casters are designed to bolt the tapered legs of the Mark V.
Lastly, the shelf that holds the SPT's worked great, but the clocks that you drill to hold them had to be modified on some of the tools to accommodate the modern dust chutes. To store a modern Shopsmith Scrollsaw the table must be tilted 45 degrees or so, and the 2X4 mounting base has to be attached very close to the leading edge of the shelf. Better yet would be to just purchase mounting bases from Shopsmith or on eBay, but that adds up to serious change for something that just sits there, and I guess if you've been this self-sufficient, you might as well go the extra mile.